2x Bi-Xenon CP6024LHD CLASSIC H1 Projector Housings. THIS KIT DOES NOT INCLUDE BULBS OR BALLASTS. -Specially designed Bi-Xenon projector (High and Low Beams). -7" Round Waterproof Headlights. 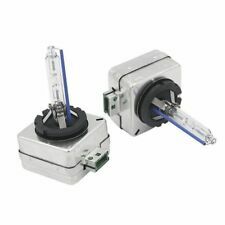 2x Heavy Duty Wiring Harness w/Relays and Fuses. New headlights refurbished heating cup three perfect upgrade. 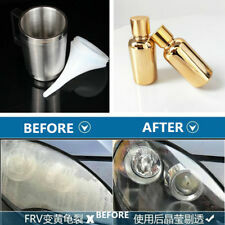 Function: headlight repair tool atomization cup. 2, the end of the power cord into the cup base, the other end into the cigarette lighter socket, red light to start heating. 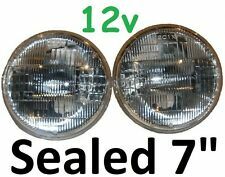 UNIVERSAL 6" 4X4 DRIVING LIGHT (SET OF 4). ADJUSTABLE ROOF RACK. Can Be Mounted On Grille Guard, Grille Bar, Bumpers, Roof Rack / Mount. 44"-60" Adjustable Clamp Down Roof Gutter Type Door Light Rail. Although HID ready - most people use these with their normal H4 halogen style globes. The Prismatic reflector has shaped curves that do the spreading out of the light in a shape such that to the right it points down a bit so as not to blind oncoming traffic yet to the left it is higher. 2 x Projector Shrouds. Fits for H4, H7 Headlight. Cut-off beam options: LHD. LHD -- Left-hand-drive, steering wheel on the left, the car in Russia, USA.etc. 2 x H7 adapters. 2 x H4 adapters. 2 x Bi-xenon projector lens. I cant imagine them possibly being any brighter. And lets say you have your left indicator on - the DRL will turn off and flash AMBER in sync with your indicator. Also if you hit the hazard lights both flash AMBER together in sync with your hazard lights. Capacity: 500ML. New headlights refurbished heating cup three perfect upgrade. 2, the end of the power cord into the cup base, the other end into the cigarette lighter socket, red light to start heating. To be frank it's a one man race. Also the quality of the units sent out of China is total rubbish - the white halo is dull almost grey by comparison to our exceptionally bright white. And their white halo stays on while the amber flashes making the flashing amber even less noticeable. Car Headlight Lens Repair Tool Kit Spray Atomized Cup 2X 30ML Atomized Liquid. 2X Headlight atomized liquid. Liquid into the cup about 30ml. 1Xatomized cup. 1, the dedicated supporting the electromagnetic atomization tool to open, the syrup to join 30-60ml, cover the lid after the steam tube inserted;. The Prismatic reflector has shaped curves that do the spreading out of the light in a shape such that to the right it points down a bit so as not to blind oncoming traffic yet to the left it is higher. It gives the neon tube look rather than a string of small lights in a row. Note many Halo lights have rings of small led's or their tubes only have 4 x LED globes. Our most popular 7" light is our crystal. What's the point replacing rubbish with more rubbish - that didn't solve my problems. One never fired up and the warranty process took about 3 weeks. The HID Kit is super bright 55W (Not 35W) HID Hi Beam and HID Low Beam. High /Low Beam Version. 5” X 7”Square LED Headlight. For Truck Jeep Cherokee XJ motorcycle. High performance withstand shock and vibration. We will reply you within 24- 48 hours. 5” X 7” Headlights. Power: 85W LED auxiliary light source. High beam power: 85W. Lower beam power: 35W. 1 pc x headlight (It's only 1 pc, not 1 pair). 5.Die-Cast Aluminum Alloy Housing in Black with high heat dissipation. (Function: Anti Flicker,White DRL. Power: 30W@High Beam,20W@Low Beam（High Intensity Cree LED). Luminous: 4500LM@High Beam,3000LM@Low Beam. 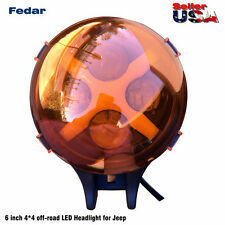 Replaces Headlight type: H4651 H4652 H4656 H4666 H4668 H6545. But most of the vehicles just plug and play(or need adapters). 1 pair (2 lights) 7" JTX LED Hi/Lo headlights with White Halo Rings that flash AMBER when turning. I cant imagine them possibly being any brighter. And lets say you have your left indicator on - the DRL will turn off and flash AMBER in sync with your indicator. 2pcs H7 110W 30000Lm LED Car Headlight Conversion Globes Canbus Bulbs Beam 6000K Kit. Color Temperature: 6000K white. Perfect 360 degrees beam pattern, increasing lighting angel from 120 degrees up to 175 degrees, eliminating the dark areas. MPDELS AVAILABLE: H7. 2 x H7 LED Headlights. Refined Vacuum copperheatsink streamlines Heat away from the led. White light source, easy to accept by the human eye and will not feel tired. Stronger ability of anti-explosion,shakeproof,high temperature resistant,high pressure resistant. Our top of the line 55w H4 Hi/Lo HID Kit. Heavy duty, slim line, AC non static, waterproof and robust. These are crazy bright and easily twice as bright as the cheaper 35W kits. But note they are not for everyone. 12v H4 Globes 60/55w x 1pr. HID Globes x 1pr. 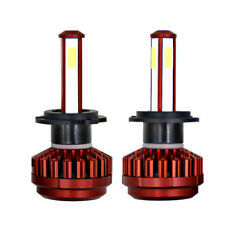 Just released - 1 pair (2 lights) 7" LED Hi/Lo headlights with RED Halo Rings that flash AMBER when turning. These lights were made with the initial objective to be LED. Powering the DRL Halo is dead easy - the black wire is earth and the white wire is power - connect the white wire to the parkers if you want them on with the parkers, or wire them to the accessory circuit (with an optional on/off switch) if you want them on when ever driving but not have the tail lights on which is what you get with the parkers - plenty of easy options. These lights have been put through their paces. And not one broken one yet. Just be aware that almost all the others on the market are not like this. The lens is a poly carbonate - its not plastic and its not glass. These lights have been put through their paces. And not one broken one yet. HID Globes x 1pr. 12v H4 Globes 60/55w x 1pr. 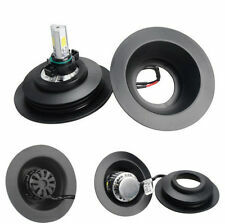 Just released - 1 pair (2 lights) 7" LED Hi/Lo headlights with BLUE Halo Rings that flash AMBER when turning. Color Temp: 6000K Cool White. 30,000 hours of continuous light with heat protection and a strong 6K Cool White beam. 2Pcs Ice Blue 80W H7 LED Bulbs For Car SUV Auto Low Beam Headlight DRL Fog Light. 2Pcs Car 80W H7 8000K 2828 LED Bulb Kit No Error 50W 6Ohm Load Resistor Decoders. These are excellent all rounder lights. The flat glass lens is rippled vertically so as to disperse light sideways. The ripples that would normally shoot light to the right are also tilted downwards so as to not project light into the eyes of oncoming drivers. The LED ring is white when off and Green when on. This is a pair of 2 x new 7" round lights with Green Halo. These are multi purpose crystal beam lights. Ideal for great forward projection vision.